I arrived in Norfolk aboard HALIMEDA late on November 9th at the end of an intermediate coastal cruising class that started in Rock Hall, MD. Next day, my coastal cruising students completed their ASA exams, packed their gear, helped me clean up the yacht, and departed for their homes. They had been a good crew, very pleasant to sail with and all very eager to learn which makes my job all the more satisfying. But it was now time for me to shift focus to the very large task that lay ahead; that is, a 1500 mile ocean passage from Norfolk to St Thomas during Fall conditions with strong, quickly moving cold fronts, intense low pressure systems and some inexperienced ocean crewmembers. I had five days before they would arrive onboard, and I set about preparing HALIMEDA for the upcoming challenge. I closely inspected the engine and generator, changed oil and filters, caulked some chain plates, applied water proofing to the bimini, renewed the genoa furling line and staysail sheets, organized navigational charts, updated the weather fax programming, had the life raft inspected and certified, cleaned the graywater pump strainer, replaced the generator seawater intake strainer basket, organized the rope and spare parts lockers, checked the integrity of hinge pins in all port lights, secured the dinghy and outboard motor for sea, renewed the polypropylene lines on the man overboard gear, bought fresh batteries for all portable lights, and verified that all necessary heavy weather gear was onboard and in proper condition. On November 15th, my ocean crew started arriving in the afternoon. A cold front had passed our location the day before and the weather was bright, clear and brisk. 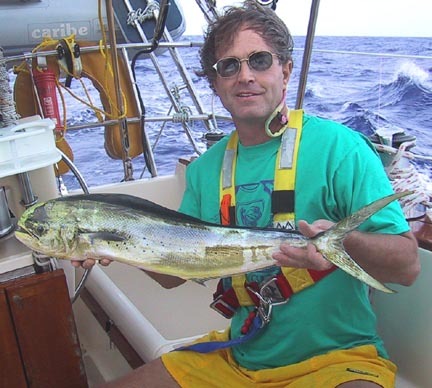 Steve Atkinson is a college English professor on sabbatical, writing a book and decided to clear his mind with an ocean sailing experience. 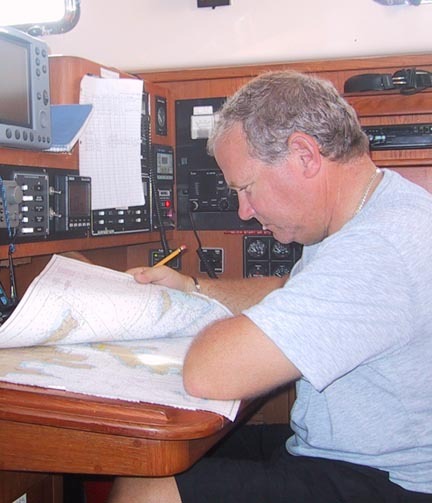 Mark Johnson is currently retired from the communications industry, recently completed the intermediate and advanced coastal training cruises with The Maryland School and is taking this ocean training cruise to complete his ASA certification levels. 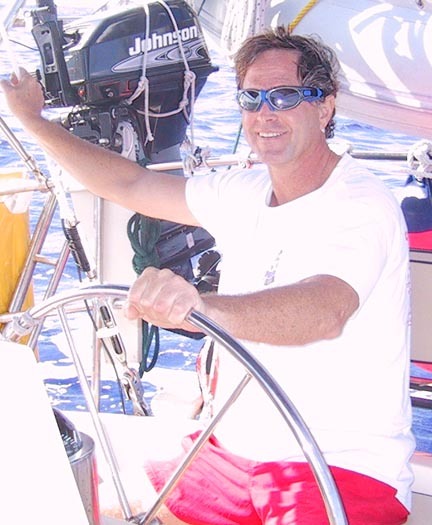 Bill Batchelor is a dental surgeon who cruised from Bermuda to Norfolk with The Maryland School in 1999, and joined this cruise for a longer and more challenging ocean sailing experience. 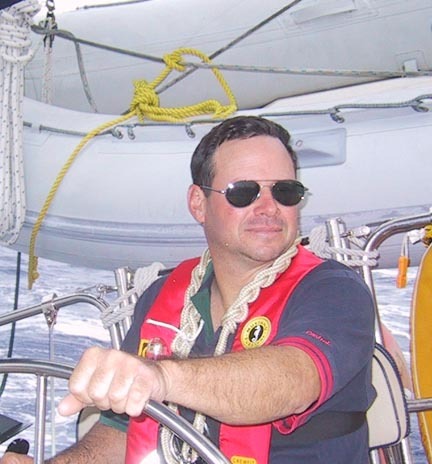 Craig Bilodeau is a USCG Near Coastal licensed Captain who teaches at the basic sailing level for The Maryland School and joined this cruise to sample ocean cruising. 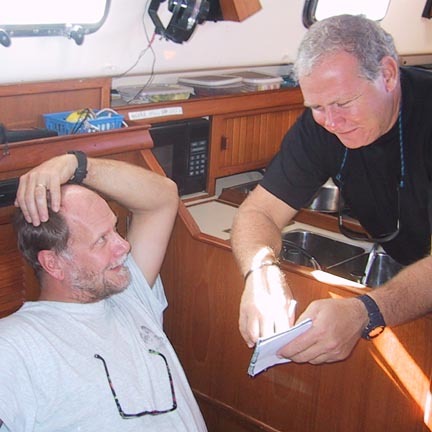 Lee Tucker, our First Mate is a USCG Near Coastal licensed Captain and a Medical Doctor who has sailed with The Maryland School on about ten previous ocean training cruises. 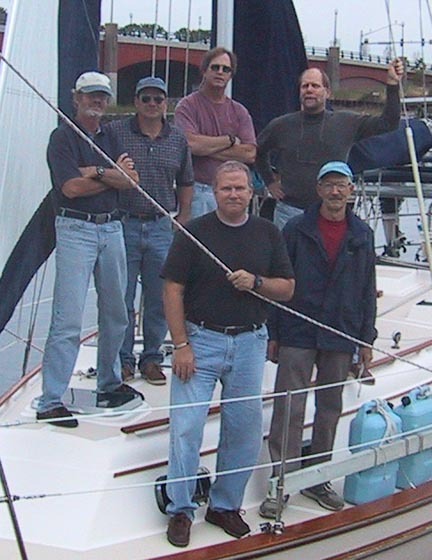 Individually and together, this was a fine group of crewmates to sail with on a long ocean passage. 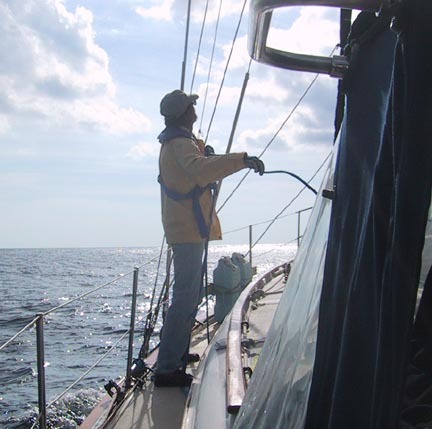 We promptly began with the task of getting prepared for a 1500 mile ocean cruise. I assigned Bill as Boatswain, Mark as Boatswain Mate and Navigator, Steve as Emergency Coordinator and Craig as Engineer. Each had specific checklists to accomplish in getting ready for sea; these lists are part of The Maryland School's Offshore Training Cruises Manual and have been developed over a number of years while we conducted more than 120 ocean training cruises. 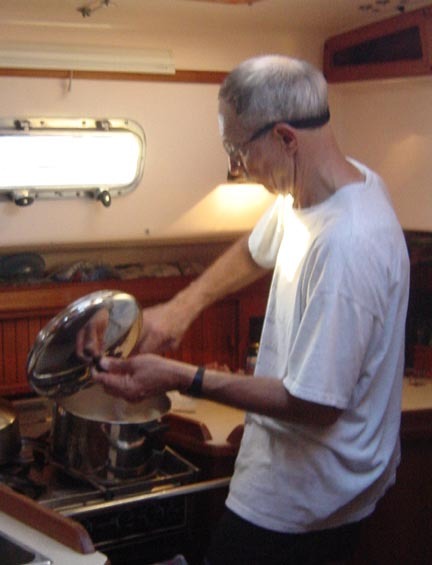 First Mate Lee worked with the Boatswains in reviewing all deck gear and the sailing rig. I worked with the Engineer, Emergency Coordinator and Navigator inspecting and preparing their areas for sea. This effort would take about 2-1/2 days to accomplish before departing port, and by that time we should know every inch of HALIMEDA, spare parts, tools and normal and emergency operating procedures. Also, we'll get to know each other and begin to develop the personal relationships necessary for successful operation of a small yacht at sea for an extended period of time where the essential motto is: "Take care of your ship and your shipmates, and they will take care of you." Deployed sails one at a time at dockside, and reviewed details and methods of handling each line including safe and efficient winch techniques. 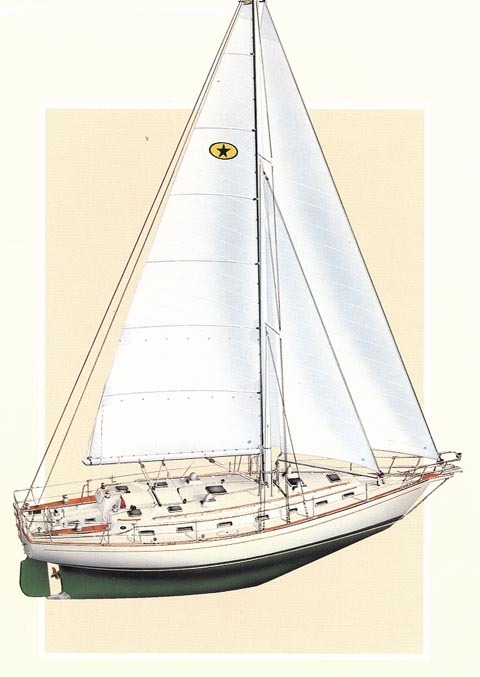 These included the mainsail, genoa, staysail and trisail as well as the boom crutch and whisker pole but not the cruising chute because of the prevailing wind conditions at dockside. We then continued work on checklists and discussed watchkeeping procedures and man overboard procedures and equipment and abandon ship procedures, equipment and a walkthrough. Dr. Lee reviewed the contents of the medical kits and briefed everyone on guidelines for emergency first aid. Also, we have a medical advisory arrangement with the George Washington University Hospital for remote guidance via SSB radio during medical emergencies, and we reviewed procedures for contacting them in such cases. Continued with boat inspections and checklists. I went to the top of the mast to inspect condition of rigging, lights and the wind indicators. We pulled the sea anchor gear out of storage in the cockpit lazarette and practiced its setup for deployment at dockside. This rig consists of an 18 foot diameter parachute, tripline and depth control float; 300 feet of braided nylon rode; the ship's ground tackle anchor and 150 feet of chain; and a bridle allowing six points of attachment to four docking cleats and the two primary winches. Also inventoried all tools, spare parts and onboard food provisions and prepared a shopping list for additional items needed including any special food and drink preferences by crewmembers. HALIMEDA is equipped with the following sources for obtaining weather data: a Furuno Weather Fax with built in SSB receiver, an ICOM 710 SSB radio, two VHF radios, and a NAVTEX receiver, and each of these units has a separate, dedicated antenna. The VHFs receive the NOAA voice forecasts for coastal waters out to ten miles or so. NAVTEX receives text forecasts on an LED screen out to about 200 miles. The SSB radio receives voice forecasts for ocean waters and is of virtually unlimited range depending on atmospheric conditions. And, the weather Fax receives graphic images of weather systems over large geographic areas including the high seas and entire continents, and is also of virtually unlimited range. We closely monitored these weather sources during this preparation period to ensure departing in optimum conditions. It has been aptly said that you can choose your cruise departure weather but cannot usually choose your arrival weather. Generally, leaving from the east coast of the US and sailing south or southeast, it's ideal to leave on the heels of a low pressure storm system with a trailing cold front so as to have strong following winds and seas. This enables you to make maximum distance during the initial few days before the next storm system inevitably comes through. Also, it allows the crew to acclimate to sea-conditions before conditions worsen. In late November, this area experiences the frequent passage of quickly moving lows pressure storm systems and strong cold fronts, which regularly produce winds of 30 knots or more and seas of 15 feet or more. Threading the needle between these systems is desirable to minimize discomfort, injury and equipment damage, and a keen analysis of developing weather conditions is necessary to achieve this. So, during our prep days, we keep a close watch all of our weather sources as well as shoreside TV, Internet and newspaper weather images and forecasts. On November 16th, a Low developed in the Gulf of Mexico and was forecast to reach Norfolk within 24 hours. It crossed us on November 17th and raced to New England by the next day producing gale-force winds and 15 foot seas in the Gulf Stream outside of Cape Hatteras and the season's first winter blast of cold, ice and snow in the northeastern US. By November 18th it intensified into a severe storm over Nova Scotia and charged off to England trailing with it a beautiful cold front, which crossed us in Norfolk with 20 knot northwesterly winds and clear, cold weather. Ideal for departure on our planned date, and we were ready. Completed our final inspections and check lists, topped up water tanks and reviewed watchkeeping procedures. I made the following watch assignments: Bill and Mark on the midnight to 0400 and 1200 to 1600 watches; myself and Steve on the 0400 to 0800 and 1600 to 2000 watches; Lee and Craig on the 0800 to 1200 and 2000 to midnight watches. Watch Captains were Bill, me and Lee respectively. Obtained final weather forecasts which looked good, made calls home and cast off lines at 1100. The day was clear, cool and bright. Winds 10 to 15 knots from NW. Our route plan called for us to sail a rhumbline of 136 degrees True to a point 300 NM south of Bermuda, and then turn south toward St Thomas. Strong easterly Trade Winds usually develop in December in the tropical latitudes, and we wanted to get east to our final longitude before we were too far south and into the Trades. Thus, this banana shaped route. Another factor related to route selection is that we'll be pushed about 30 NM to the NE when crossing the Gulf Stream less than a day from now, so we favored remaining south of the rhumbline prior to then. We passed Cape Henry at the Chesapeake Bay entrance at 1250, set the main and genoa sails and set a course of 150 degrees Magnetic; at 1630 we headed up to 165 degrees M to improve sailing performance. 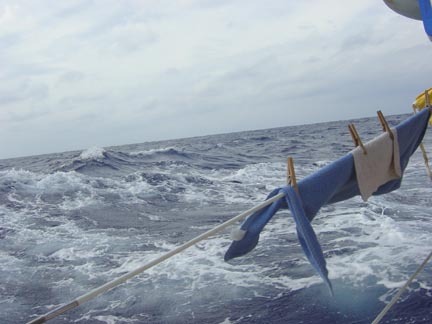 Winds lightened as evening fell and we began motor sailing to maintain speed. During the night winds continued to lighten and we struck all sails and motored as I wanted to get across the Gulf Stream before the next weather system came through. By midnight we made 58 NM since departing Cape Henry. Winds remained light and we sailed or motor sailed throughout the day and evening. Conditions were ideal to begin our novice celestial navigators with the finer points of taking shots on a rolling pitching little boat at sea, and we made good progress in this. We kept a meticulous dead reckoning (DR) plot as the basis our ocean navigation process. We plotted the DR on large NIMA Position Plotting Sheets using sheets number 923, 924, 925 and 926 for this entire cruise. Hourly, the on-watch logged the course, distance and other data needed for the DR plot. At the end of each four hour watch, they reduced the data and drew the DR line for that period; this way, we always had an up to date DR plot when needed for celestial or other purposes. Throughout the night and following day winds varied up and down between 3 knots and 18 knots and directions from NW to SE. We continued sailing and motor sailing staying reasonably close to our rhumb line. 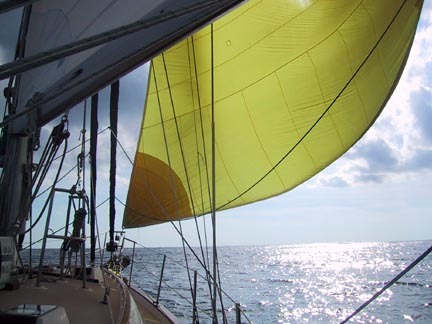 At 0930 we furled the genoa and raised the cruising spinnaker and charged along on a beam reach at 6-1/2 knots on 8 knots of true wind speed- exhilarating sailing until noon when the winds lightened and we doused the chute and went back to motorsailing. 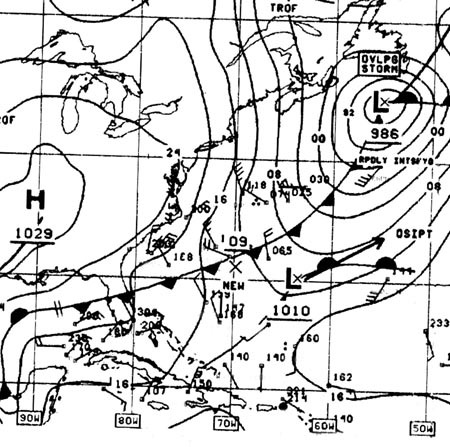 At mid-day, the weather fax printout showed a low pressure system developing over Mississippi, and predicted it to move east toward Florida; it also predicted that the high pressure air, which had dominated our weather for the past two days, would quickly move NE to Nova Scotia. This suggested a possible encounter with that low in subsequent days. And, the 1700 voice weather from NMN in Portsmouth, VA forecast a low pressure system reaching the Virginia Capes by Thursday night and Friday and predicted gale force winds offshore on Friday and Saturday. By midnight we made 141 NM for the past 24 hours. During the early morning wee hours, winds increased a bit to 15 to 20 knots and remained E, and we sailed on port tack. 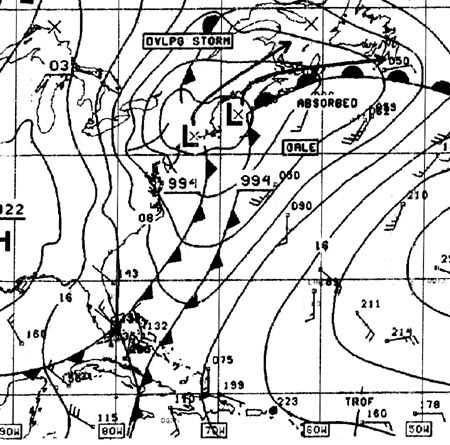 The weather fax showed a stationary frontal boundary in our vicinity, and at 0600 we sailed through it and winds went from ENE to SSE but remained at 10 to 15 knots. During the day winds gradually clocked to S then SSW indicating that the Low was moving north as predicted. 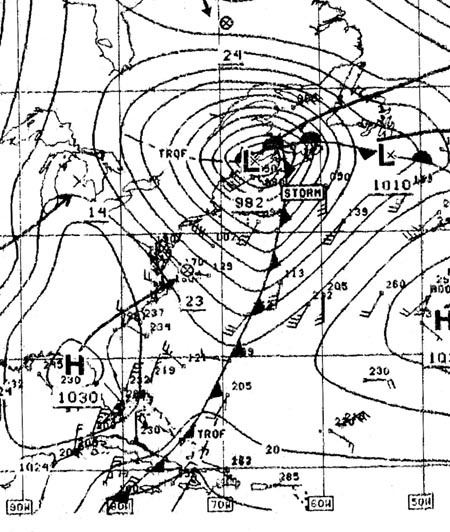 The midday weather fax showed the Low, now clearly defined offshore east of Georgia and predicted to move offshore to Nova Scotia by Friday carrying gale force winds offshore. It therefore behooved us to make as much easting as possible in hopes of letting the Low pass astern of us, and at midday we went over to starboard tack and charged east. By midnight we made 154 NM during the previous 24 hours. Overnight we continued sailing east in light southeasterlies. By dawn the winds clocked to SW and increased to 20 knots and we charged changed SE at full gallop toward our waypoint. Skies were covered with scattered cumulous and high cirrus clouds and later by stratus clouds. Just before midnight we were hit by a strong squall with winds to 45 knots, which we rode out under staysail and deep reefed mainsail. The weather fax showed two cold fronts approaching from the west and we were probably seeing the advancing squalls being pushed by those fronts. By midnight we made another 172 NM. Now we're cookin'. During the night winds continued at 15 to 20 knots from the SW and we maintained our SE heading under genoa and reefed mainsail. At 0100, Bill and Mark sighted a ship 3-1/2 miles ahead with numerous working deck lights that obscured her range lights and running lights so it was initially difficult to determine her heading. Radar showed she was on a reciprocal course and that we were closing fast, so we gybed away to avoid crossing her bow at close range. Refer to Bill's description of this encounter at http://www.mdschool.com/Letters/Batchelor2.htm. During the day, winds clocked to NW at 15 to 20 knots, and we headed up to a course of 190 degrees Magnetic to keep the sails drawing and maintain boat speed. By afternoon skies began to clear and the barometer rose by 10 millibars as the first cold front passed over us. 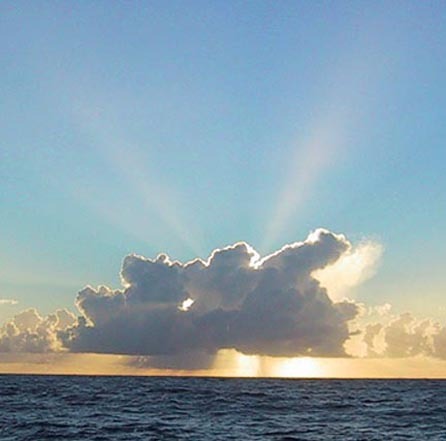 We continued with excellent sailing and made another 157 NM by midnight. We were now about 150 NM from our waypoint at 27N & 65W. Winds clocked to north, then to NE by sunrise and we sailed comfortably on a SE course toward our waypoint. Skies were clear and bright with scattered cumulus clouds. By evening, winds went east at 15 knots and we sailed close hauled on main and genoa making seven knots in comfortable seas. The low pressure system that had passed behind us on Thursday was now centered over the Gulf of St Lawrence and became a huge storm system with closed isobars reaching as far south as 32N. Dorado!! At 1600, the fishing line that Lee had been dragging faithfully since we left Norfolk, came to life with a strike. Lee grabbed the rod and played the fish in as the helmsman slowed the boat's speed by pinching up to windward. 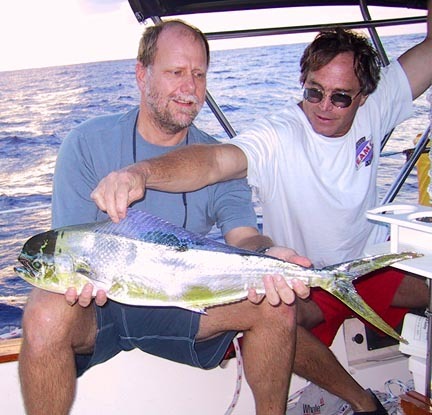 Lee deftly boated a beautiful ten pound dorado that danced in the cockpit with glistening colors of green, yellow and a salmon colored stripe. Bill held it with his foot while I poured some vinegar into the gills to dispatch his spirit to King Neptune. Lee then, with surgical precision, skinned and filleted our catch with a sharp fillet knife supplied by Craig. By 1700 we were enjoying a delicious dinner of Mahi-Mahi, black beans and rice plus a salad with feta cheese. A perfect meal and a perfect evening, and by midnight we had made an additional 142 miles. At 1100 today we completed a full week at sea and we're having a ball! By noon we reached our waypoint at 27N/65W and turned south toward St Thomas as winds continued at 15 knots from the east. At 1500 Bill hooked into another Dorado on his handline and brought it in with expertise while avoiding tangles with all the gear hung on the stern rail. Again, a little vinegar to quiet the fish's nerves and another very fresh fish dinner. This time a fish chowder prepared by Cap'n Tom. By midnight we completed an excellent day of sailing with another 190 miles added to the log. Clear and bright skies for most of the day. Winds at 10 knots from the east and SE. Sailing close hauled on port tack on a magnetic heading of 185 to 200 degrees which is pushing us a little to the west of our rhumbline and forcing us to give up some of the easting that we previously achieved. Very pleasant conditions; warm and bright. Smooth seas. Stereo music playing an Enya recording. Caught another Dorado. Made 151 NM as of midnight. Now we're thinking seriously about arrival in St Thomas; only 300 miles to go. Some discussion about airline flight schedules. And where to go in St Thomas. What hotels and restaurants are best. Tentative plans are made to enter the Virgin Islands at Jost Van Dyke and spend an afternoon anchored in Caneel Bay on St John Island. In the afternoon, winds clock to SE and then to south... now we're really being pushed to the west and away from where we want to go. Might need to tack... if so, we'll loose a day. Made 144 NM as of midnight but lost a lot of easting. Thanksgiving Day, and we have much to be thankful for... Winds still from the south in the morning and forcing us to the west of our rhumbline; it really looks like we may need to tack eventually to regain easting and loose a day in the process. In late morning, winds backed to SSE and by 1500 backed to ESE!! Now we're cookin' and headed straight for St Thomas with 90 miles to go! But, with being blown west over the last two days, we'll need to enter through Virgin Sound to the to the west of St Thomas. At 8:00 pm I leave instructions for the night watch to wake me before passing south 18 degrees-35 minutes north latitude. The purpose is to ensure that I'm on deck as we approach landfall. As of midnight we made 153 NM during the last 24 hours, and we were 28 NM from our arrival waypoint. We've kept a meticulous DR plot during the entire cruise, and Navigator Mark took a lot of celestial shots to add to the DR. Landfall is where the cheese gets binding and right now the DR is heading straight toward our destination waypoint. At 0400 it puts us 6 NM from the finish line with the hills of St Thomas towering ahead... Nice going Mark! At 0600 the depth sounder comes alive and indicates that water depth is less than 600 feet... we're on soundings! We're heading straight for the west end of St Thomas and the off-lying Savana Island. We'll be conservative and round Savana, rather than pass between it and St Thomas, and turn East toward Water Island and West Gregerie Channel leading into Crown Bay. I've assigned the Conn to Bill for port entry, which means that he'll be in charge and calling the shots during this delicate phase of arrival. Mark will continue as Navigator with the assignment to plot our GPS position on the chart at 5 minute intervals plus plot compass bearings to land objects as a confirmation of our position. Steve will shoot compass bearings of land objects and help identify landmarks. 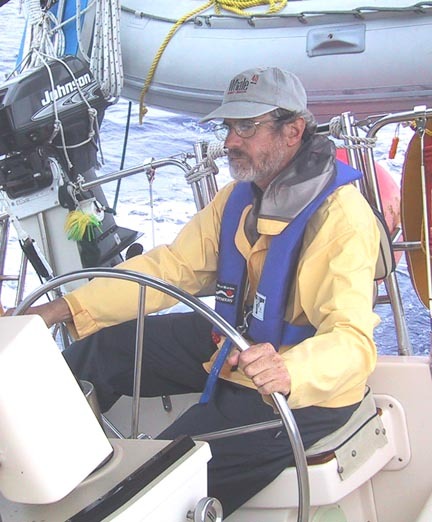 Craig will serve as helmsman, taking steering orders from Bill, and maintain a general lookout. Lee will serve as bow watch and general lookout. Landfall after a long ocean passage is fraught with it's own special kinds of hazards as the crew needs to transition from ocean-attitude to coastal-attitude. In the big, wide ocean it usually doesn't matter if you're a few miles this way or that way. But in coastal, a few hundred feet may make a huge difference. Many mistakes can occur because crewmembers are not fully synchronized with the change in ship motion, timing, distances, duties, procedures and other factors. Fatigue and the euphoria of port arrival can distract crew from their immediate duties, and boisterous chatter about parties ashore can overwhelm important communications between crewmembers. And in an area like this, running aground on a rocky or coral reef can sink the boat. The team was fully prepped for the duties at hand and they worked like champs. We made the turn at Savana Island, headed east into Southwest Road and furled sails, then continued east toward West Gregerie Channel. Within a mile of Crown Bay, Mark took over the helm for entry into Crown Bay. About this same time we were overtaken by a dozen power yachts roaring toward Crown Bay, and they overwhelmed the radio channels with requests for slips and entry instructions. We just circled for a half hour until it quieted down and then asked for permission to enter and go to the fuel dock, which was promptly granted. Mark expertly brought us in to the fuel dock and at 1000 hours all clambered ashore to kiss the dry, steady earth. We topped up with 60 gallons of diesel and proceeded to out slip. Some statistics for the cruise: Elapsed time 10 days & 23 hours. Distance 1660 nautical miles. Average speed 151 miles per day. Fuel used 60 gallons for the main engine and generator. No injuries. No serious equipment problems. Altogether, a happy ending.